SALT LAKE CITY (AP) — Zack Moss has seen this before. 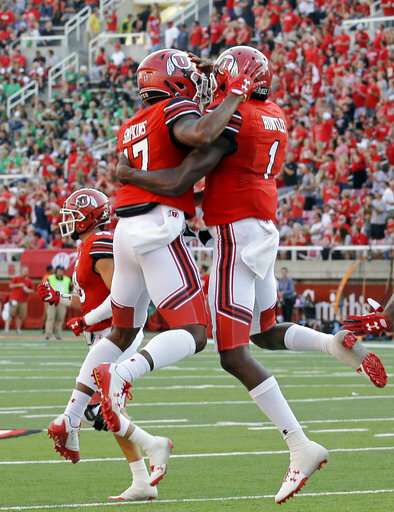 The sophomore running back started in the Utah backfield alongside sophomore quarterback Tyler Huntley, his Hallandale (Fla.) high school teammate, and the pair shined in the Utes’ season opener on Thursday night. Huntley threw for 227 yards, rushed for 70 and accounted for three touchdowns as the Utes overwhelmed FCS North Dakota 37-16. 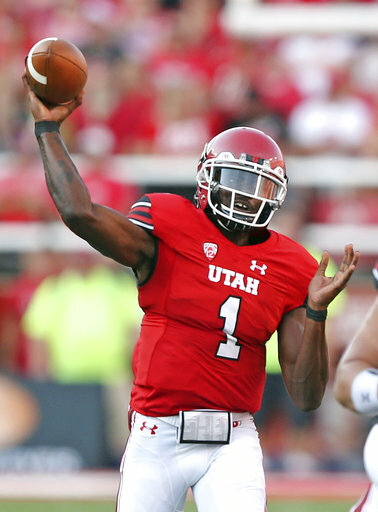 Utah debuted its new fast-paced, pass-first, spread offense with first-year offensive coordinator Troy Taylor and the difference was apparent from the start. “Oh no, no nerves,” Huntley said with a smile. “We all just had to adjust at the beginning and then we started playing from there. Huntley had his mistakes with some bad decisions and some errant throws, but he repeatedly made plays with his arms and legs and posted career-highs in passing and rushing yards. Moss finished with a career-high 128 yards rushing and a touchdown on 22 carries. Oregon transfer Darren Carrington had 10 receptions for 127 yards and a touchdown. The Utes scheme is designed to throw early and often, but Taylor has insisted the run game will be a big component. Utah ran for 272 yards. North Dakota quarterback Keaton Studsrud threw for 175 yards and a touchdown. The run game was bottled up for 51 yards. “One thing I ask our team to do is play hard for 60 minutes and I think our guys did that tonight,” North Dakota coach Bubba Schweigert said. “We can execute better. On the defensive side, we obviously had a tough matchup with Carrington. He hurt us. NORTH DAKOTA: The Fighting Hawks simply didn’t have the speed or the size to really threaten Utah, but they were hung around into the fourth quarter when they trailed by just 11 in the final 15 minutes. Coaches should be pleased with the overall effort against a more talented and deeper team. 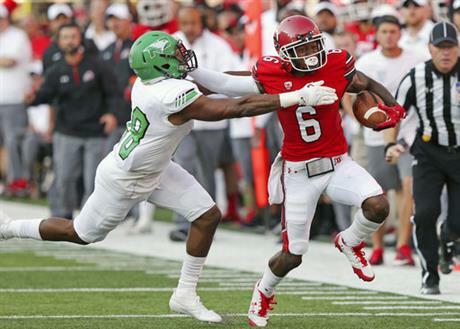 UTAH: Gone was the grind-it-out rushing attack that has been a staple of 13-year coach Kyle Whittingham as the Utes were in three- and four-receiver sets much of the game. Taylor picked Huntley to start his first game and direct the scheme over returning senior starter and two-time captain Troy Williams due to the sophomore’s dual-threat ability — which was on display. There remains plenty of room to grow as several would-be touchdown drives stalled and turned into field goals. Utah running back Armand Shyne was seen on the sideline with a cast covering his left forearm and wrist. Whittingham announced during camp that Shyne was out for a significant amount of time with an undisclosed injury. The junior was in competition to be the starter before the injury. Chase Hansen started at strong safety and played throughout the game despite being a game-time decision with an undisclosed injury. The Utes do not typically announce injury details unless it is season ending. Utah had the 12th most penalty yards in school history with 139 yards on 11 flags. The Pac-12 has instituted a test program during nonconference games to help speed up the game. Thursday’s game implemented three of four of those measures. There were reduced breaks in between the first and second quarters and the third and fourth quarters. The game featured adjusted commercial breaks aimed at reducing four minutes of time. Kickoff was mandated to be one minute after the scheduled start of the game. The final measure is to reduce halftime from 20 minutes to 15 minutes, but both teams must agree. Utah officials said North Dakota did not agree to that adjustment. North Dakota returns to FCS action when it hosts Missouri State on Sept. 9. Utah travels to face rival BYU on Sept. 9. The Utes have won six straight against the Cougars.